The Presque Isle Wildcats celebrate after being presented the gold ball Saturday following the Class B state soccer championship held in Hampden. HAMPDEN, Maine — Down two goals less than five minutes into the second half of Saturday’s Class B boys soccer state final, the Presque Isle Wildcats were in familiar territory. The previous 24 Eastern or Northern champions in this class had lost this particular match by a combined score of 57-12. Little suggested Presque Isle was about to defy a quarter-century of regional futility — until a stunning three-goal comeback capped off by Drew Cameron’s goal with 9:32 left in the second overtime gave the Wildcats an improbable 3-2 victory over Freeport for their first boys soccer state title at the windy Weatherbee Complex. “The motto of this team is, ‘We work hard and we never quit,’” eighth-year Presque Isle coach Joe Greaves said. “We’re not necessarily the most skilled players in the state, but heart, grit, determination and The County way goes a long way. The game-winning play began in the center of the field, with senior defender Torey Levesque lofting the ball ahead toward teammate Connor DeMerchant. DeMerchant was one of four players — and the only Wildcat — pursuing the lead pass near the edge of the penalty area. He was joined by charging Freeport goalie Atticus Patrick and two other defenders chasing the Wildcats’ junior forward. But DeMerchant got there first, just in time to deflect the ball off Patrick and out to the right wing where Cameron was trailing the play. Cameron wasted little time in shooting the ball inside the far post of the uncovered goal. Far from sudden death, the goal set off a sudden celebration. “We fought all year to get to this point,” DeMerchant said. Cameron’s goal, which came 100 minutes, 28 seconds into a match that began amid heavy rain and continued through gusty wind, was made possible in large part by the goalkeeping of Presque Isle senior Mason Young. 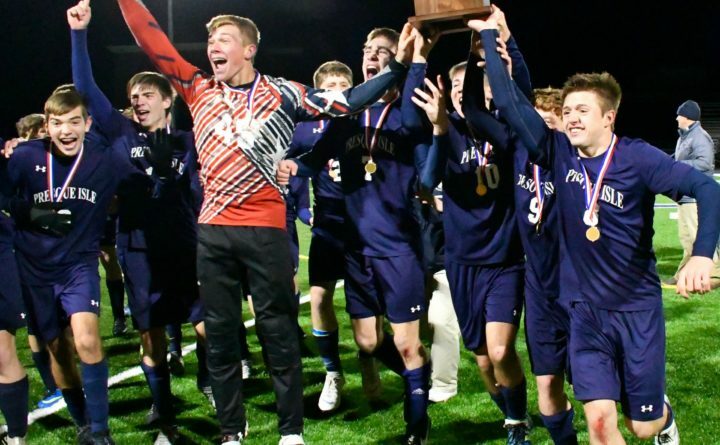 Young, a first-year starter who stepped in after last year’s goalie, Jason Dumais, was sidelined by a knee injury, made 19 saves, several of them spectacular, against a Freeport team seeking its first state title since 1978. It didn’t look like the Wildcats would fare any better than its 24 predecessors after Will Winter headed in a goal off Owen Patrick’s long lead pass from near midfield 32:26 into the match to finally cash in on Freeport’s early control of play. When Will Winter then headed in Jesse Bennell’s cross from deep along the left wing 4:35 into the second half, Freeport’s 2-0 lead looked insurmountable — to everyone except its opponent. “They scored and went up two goals but we still had the breeze at our backs and I thought maybe we could press them more and get up the field, and we were able to do that,” Greaves said. Presque Isle (15-1-2) finally broke through with 33 minutes left off a restart when senior midfielder Kyler Caron redirected a pinballing ball within the goalmouth just inside the left post to cut the deficit to 2-1. Levesque tied the match with 12:54 left in regulation as he lofted a wind-aided shot that bounced high over Atticus Patrick’s head and into the net. “The turf was wet and slippery and I knew the goalkeeper comes out a lot, so I thought if we just put the ball on net we could make things happen,” said Levesque. Freeport (12-4-2) began its own celebration less than two minutes into the first 15-minute sudden-death overtime when a shot by Bennell hit a crossbar, came down and bounced off Young and into the net for the apparent winning goal. But the crossbar the shot hit had nothing to do with soccer, it was the crossbar on the football uprights just above the soccer cage. After a brief officials’ conference, the goal was disallowed. Presque Isle generated its best sustained play of the match during overtime, and while Freeport’s Silas Wagner threatened with a shot off the side of the net 2:40 into the second extra period the Wildcats were the ones celebrating moments later.